Town has an area of 15.04 square kilometers, with the bulk of that — 83% of the land– allocated to Kadena Air Base. 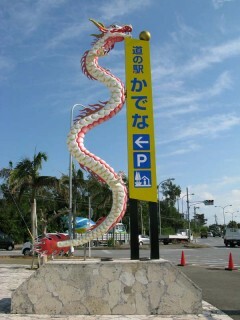 In order to see the largest United States Air Force base overseas, many tourists, including students as well as overseas tourists visit the Kadena Town every day, and “Michi-no Eki Kadena is the sightseeing spot from which the adjacent base can be overlooked,” says a local official, “and is well known”. 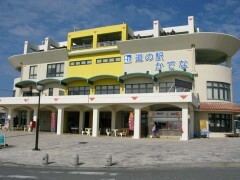 The road station is an hour drive from Naha Airport. More than 200,000 people visit Michi-no Eki Kadena every year, as it serves as a stop-off during a ride to northern areas of the island from Naha. “There are many American military bases in Okinawa, however here is the only place that we can see the U.S. Base so close,” says Tomoko Toguchi, the manager of Michi-no Eki Kadena. Kadena Air Base is a hub for Air Force activity, so a wide variety of aircraft come flying. As a result, Michi-no Eki Kadena also attracts fighter enthusiasts, professional and amateur photographers with the aim of getting a shot of a battle plane. Tourists from Kyoto were told that they could see aircraft and take a shot of fighters taking off from the observatory. They also mentioned they were surprised by the take-off noise. The observatory is also popular for people who take pictures as it has a roof, so visitors can stay dry while seeing the U.S. base even while raining.